The mid-twentieth century marked one of the greatest watersheds of Asian history, when a range of imperial constructs were declared to be nation-states, either by revolution or decolonisation. Nationalism was the great alchemist, turning the base metal of empire into the gold of nations. To achieve such a transformation from the immense diversity of these Asian empires required a different set of forces from those that Europeans had needed in their transitions from multi-ethnic empires to culturally homogeneous nations. In this book Anthony Reid explores the mysterious alchemy by which new political identities have been formed. 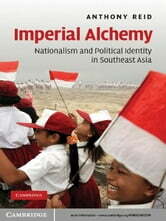 Taking Southeast Asia as his example, Reid tests contemporary theory about the relation between modernity, nationalism, and ethnic identity. Grappling with concepts emanating from a very different European experience of nationalism, Reid develops his own typology to better fit the formation of political identities such as the Indonesian, Malay, Chinese, Acehnese, Batak and Kadazan.